What’s the workbook for teacher workshops these days, the Willie Lynch letter? Some have rightly argued how could many African-American’s vote for Barack Obama just because he is of their same people group. How about because many people are tired of the only thing African-Americans are known for is being a slave! Well, at least in the report below, I see my high school’s slave auction doesn’t seem quite as bad now. For those who may feel this isn’t that bad, perhaps you’re right. Maybe we as a society shouldn’t be so sensitive. Maybe next September 11, we can have some students pretend they are jumping out windows or pretend they are held by terrorists and about to get their head’s chopped off. Of course, we could always have our Jewish brothers and sisters pretend to starve, be infected with diseases, or how hot it would feel to be in an oven. I’m sure some kids in the class will be German so they can chip in as oppressors (or say they were just following orders). Oh, that would be a real teaching moment for the kids. And before you read the article below, please remember there’s no such thing as “biracial”. There aren’t two races of human beings. That’s a topic for another day. CornerstoneDad’s, read over those school assignments! 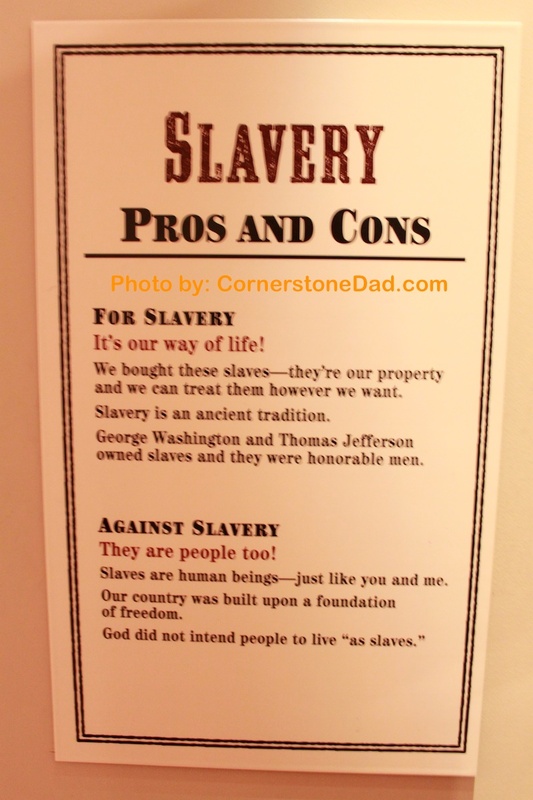 MELVINDALE, Mich. – Jessica Gibson says she won’t let her 11-year-old son complete a school assignment that she says took a lesson about slavery too far. Gibson, 27, of Melvindale, Mich., said her sixth-grade son, Taylan, received the social studies assignment from a Strong Middle School teacher last month. But her son hid it from her, later telling her he didn’t want to do it. Gibson found out about it last week. The written portion of the assignment asked students to answer five questions, which included describing what the slave area and the plantation area are like and what the owner and his family are like. It also asked students what kind of activities go on at their plantation, whether they have any friends or family at the plantation and whether anything extraordinary has happened in their lives as a slave. A video portion of the assignment asked students to talk about the life they described in the journal, according to the assignment Gibson shared with the Free Press on Monday. The teacher, Michelle Angileri, told the Free Press she wasn’t allowed to make any statement and directed a reporter to talk to the principal. The Free Press was unable to reach the principal or district superintendent Monday. Taylan had been learning about slavery when he got the assignment. He said it embarrassed him. “I’m black, and it was a slave assignment,” he said. His mother, who is biracial, said she doesn’t think anyone should be required to complete the assignment, regardless of race. “For him to pretend to be something he’s never been or never will be, that’s going too far,” she said. Last year, teachers in Virginia and Ohio held mock slave auctions in which they had white students auction off black students as part of lessons on the Civil War. Gibson said she tried talking to school officials about her concerns, but didn’t receive a satisfactory solution and doesn’t want her son to get a zero for not completing the assignment. “Find a different assignment for them to do,” she said.